Your dream sunroom is a room you and your family will enjoy day-after-day. On top of that, you also get to craft a new and unique style for the interior and exterior of your home. This can be exciting, but also daunting. It’s true that matching the new addition to the existing home décor can prove to be a serious stylistic challenge. On top of that, the vast catalog of design choices can be overwhelming for some homeowners. If you do it right, your sunroom will enhance your home’s style inside and out — as well as be one of your favorite rooms. Since Eby Exteriors is all about building gorgeous dream sunrooms — and helping people get the most out of their home renovations — we put together a guide for dream sunroom designs. 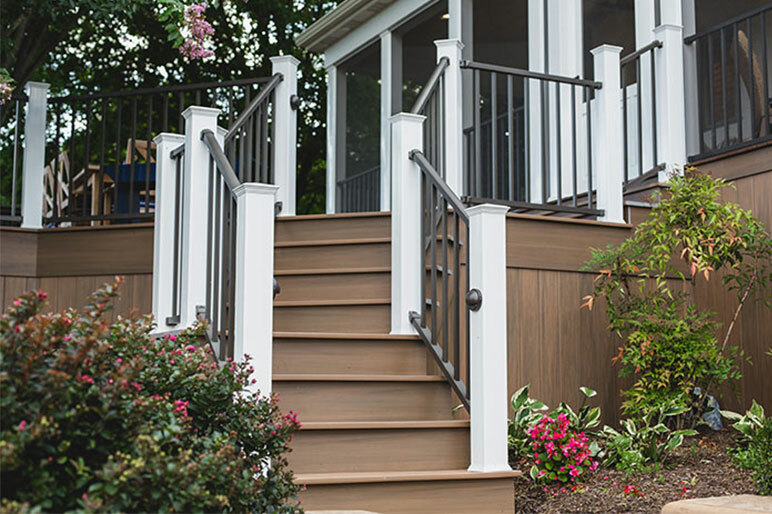 Before you can begin the design process, you need to decide what type of porch addition you want to install. Primarily, this is determined by your budget, your available space, and your needs and wants. A Sunroom —The most in-depth renovation option, a full sunroom is essentially like any other room in your house, just with ample windows and light. A 3-Season Room —A 3-season room is a fully-sealed and insulated room without a heating or cooling system. Essentially, this room offers all of the outdoor appreciation of a sunroom but can’t be used in the dead of winter. Hence the name, as it’s only available for 3 seasons. A Screened-in Porch —Netting protects a screened-in porch from bugs, but otherwise, it’s a completely open space. 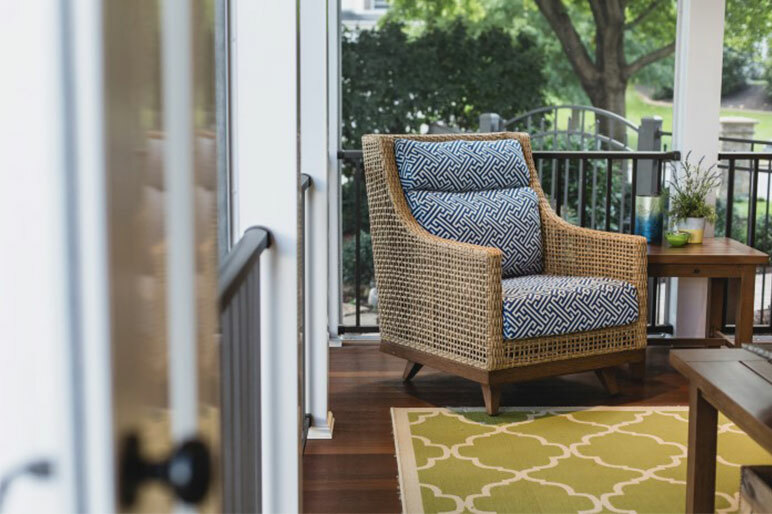 An Open Porch —An outdoor living space that’s completely open to the outdoors, a porch can still be a family hub and an entertainment centerpiece. Any of these additions are a fantastic way to enhance your home. Sunrooms and 3-season rooms do allow the most customization and nuance, so we’ll focus on those. Adding a room on to your home changes the entire exterior profile. While some homeowners want their addition to stand out against the main home’s style, generally matching the existing theme is the goal. In a sense, a good addition should look like it was there from the very beginning. 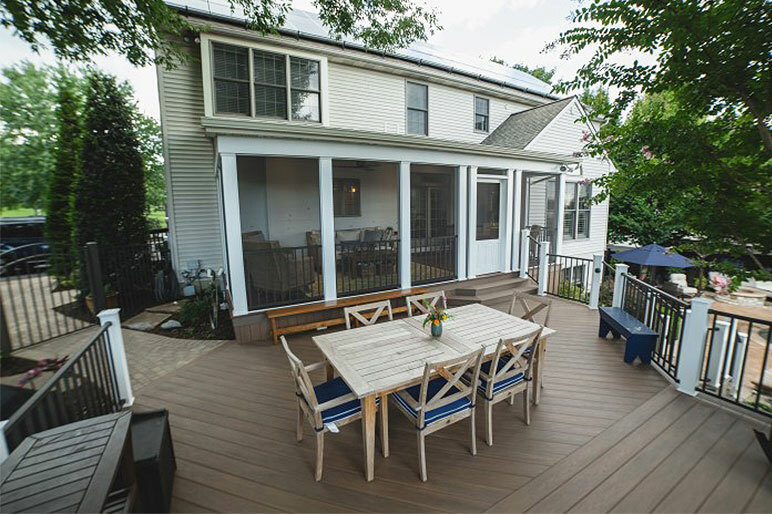 While prefab sunroom kits offer an inexpensive way to get an addition, they look notoriously out of place. This is so common to see because their boxed designs clash with the pre-existing style of your house. Siding Colors — One of the reasons that sunroom kits seem glaringly out of place is that their vinyl siding clashes against your home siding. Although it may be simple, tying the sunroom siding color to your home’s siding color connects the two projects. Textures — Similar to mirroring your home siding color, you can also match a texture such as stone veneer or brick. These exterior textures are a focal point of your house, and incorporating them into your addition makes for a compelling exterior sunroom design. Coordinated Roof — Coordinating the sunroom roof with the home roof is an effective method to visually connect the two spaces. This can be accomplished by choosing a similarly shaped or colored roof. Ultimately, matching the roofing material is less important than the color. Soffit, Fascia, and Trim — A simple yet subtle way to build a fluid sunroom design is to match your home’s pre-existing trim to the sunroom. These subtle touches go a long way to connect the addition to the rest of the design. The majority of the focus for exterior sunroom designs is ensuring the addition looks seamless with the rest of the house. Successful interior sunroom designs create spaces that have a look and feel you’ll enjoy for years to come. 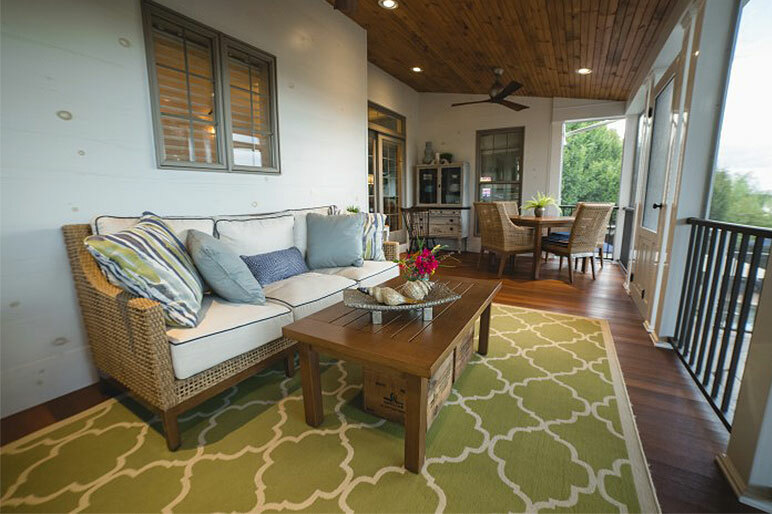 FlooringFlooring is one of the major factors that adds color and texture to your sunroom. Some of the most popular options include wood, tile, and carpet. Carpet provides the most comfortable sunroom atmosphere while wood creates a showpiece sense to the room. WallsThe walls you pick dictate the feel of the room. Drywall allows the sunroom addition to closely match the rest of your house. Shiplap or barn boards send the message that your sunroom is meant to stand out stylistically. WindowsYour sunroom exists to let the light in, so good windows are a necessity. Since budget-quality windows permanently fog up over time, opting for premium windows is key. In addition, deluxe quality windows will also help you better regulate the temperature in your sunroom or 3-season room. Vaulted CeilingsVaulted ceilings are a popular choice when finalizing sunroom design as they make the room feel even more spacious. Ceiling FansA popular sunroom accessory, ceiling fans can keep your room cooler in the summer and warmer in the winter. Recessed lightsWhile a sunroom is at its best on a gorgeous and bright summer day, a stylish recessed lighting scheme helps your addition shine — even after the sun goes down. While creating a dream sunroom design is exciting, it’s also important to ensure that your addition is legally permitted to be built. Zoning rules governing impervious coverage (any surface that doesn’t absorb rainwater) and setbacks (the distance from your property line you’re allowed to build to) can have an impact on building your addition. 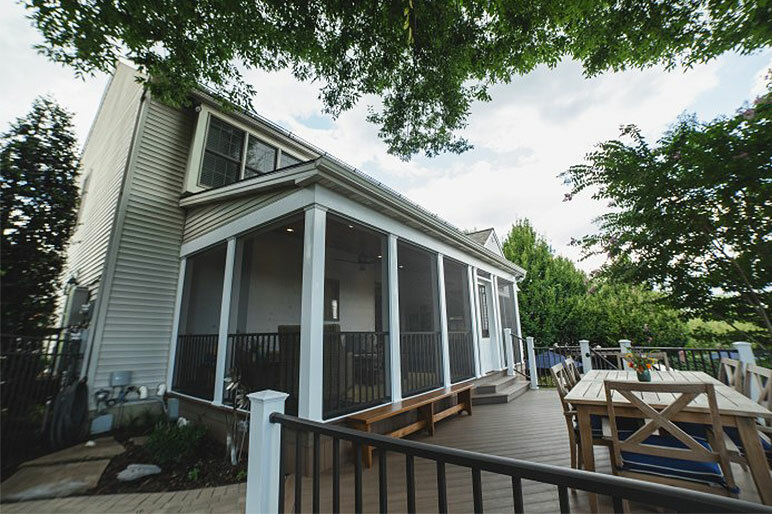 As experienced sunroom addition contractors, we have experience helping clients understand zoning rules — and designing their dream addition in accordance with those codes. Interested in bringing your dream sunroom’s design to life? Eby Exteriors is the partner you need. We have experience building a variety of high-quality sunrooms and 3-season rooms throughout Lancaster County and beyond. If you’re ready to start the conversation about your sunroom addition, contact us today! Get Started With Your Dream Sunroom Today!